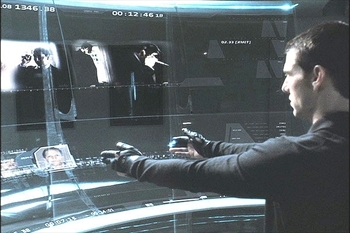 Pictured: The technology in this well-known scene from Minority Report requires no gloves and retails for $70 The Leap is a tiny 3D interactive device for your computer. It's built specifically to recognize everything about your hands. Position, direction, movement of the hand and fingers -- it can even tell if you are holding something like a pen or other tool. The SDK provides "meta" data about your hands, but no way to read the raw imagery. This seemed like a strange move given the market for similar devices, but once I used it I realized why. The Leap has a solid interactive frame of 100 - 110. This is the first time I've used a depth camera that has virtually no delay. I'm impressed. Leap's SDK is nicely written, but it's a bit tricky to integrate into Cinder right out of the box. I've written a dead simple Cinder block to wrap the SDK. Those familiar with my Cinder-MsKinect block will feel right at home with Cinder-LeapMotion. Download below. Pictured: The Cinder-LeapMotion sample app in action GET CINDER-LEAPMOTION ON GITHUB The block boils the SDK down into a small number of convenient methods and reorganizes the data a bit. There is no need to start or stop the device, because it is always running when you plug it in. All you really need to do is add a callback which receives a "Frame" and then update the device instance when you are ready for data. Each frame object contains a map of hands in view. Each hand has properties like position, direction, velocity, ball (the area your hand can grab) dimensions, and a map of fingers. Each finger has position, direction, velocity, width, and length, as well as a flag indicating whether or not the "finger" is actually a tool. The TracerApp sample leaves 3D trails behind your fingers There are five sample apps in the block. One is a basic visualizer of most of the data you can get from the block. Another, TracerApp, runs some nice light and glow effects to leave trails behind your fingers. UiApp is a basic example of interacting with onscreen objects using gestures. MotionApp demonstrates the Leap Motion API while Gesture app uses the Leap Gesture API.